Click the chart to track JPMorgan Chase's stock. NEW YORK (CNNMoney) -- Financial stocks weighed on the market Thursday after JPMorgan Chase reported disappointing results. The hits keep coming for banks this year -- from exposure to credit and counterparty risk in Europe to a slowing IPO market and mortgage fraud-related litigations. Investors have been looking for the slightest clue of improvement, but coming up empty. JPMorgan managed to beat the Street's already lowered estimates, reporting EPS of $1.02 vs. a consensus of 94 cents. But what looks like a solid quarter on the surface is actually hiding a profound weakness in some parts of the bank's core businesses. Revenue from investment banking fell 13% in the quarter, as JPMorgan had previously warned. But trading profits were boosted by gains the bank realized after adjusting the value of certain derivatives to reflect a widening of credit spreads. Excluding those gains, JPMorgan said fixed-income revenue fell 14%, while equity market sales dropped 15%. 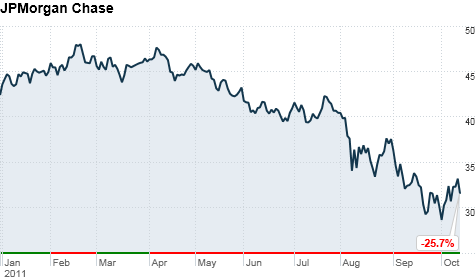 JPMorgan's (JPM, Fortune 500) stock fell more than 6% on the news. Shares of other major banks are also bleeding and trading near 52-week lows. Bank of America (BAC, Fortune 500) and Citigroup (C, Fortune 500) were both down about 6% in midday trading; Wells Fargo (WFC, Fortune 500) and Goldman Sachs (GS, Fortune 500) were down 4%. All are scheduled to report earnings next week. OptionRadar: $JPM - This is why you ignore the headlines and dig deeper into earnings - noted this morning it was a poor report. upsidetrader: $JPM "beats" for 11th quarter in a row, all u have to do is look at the stock price over that period.. banks are dead.